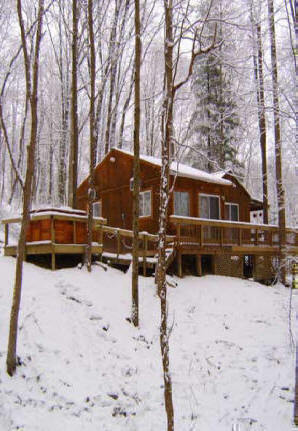 Eagle's Nest Cabin (near Old Man's Cave) offers guests cozy comfort and seclusion in the Hocking Hills Region of Ohio. This hot tub getaway is great for a romantic trip for couples or a fun-packed adventure for families. Whether watching a beautiful sunset, relaxing around a campfire with friends or simply basking in the warmth of the six-person hot tub while watching the stars, this Hocking Hills cabin is a sure way to have a great time while staying near Old Man's Cave. Complimentary coffee, tea, hot chocolate, popcorn and s'mores. 21 " tv/dvd in master bedroom. 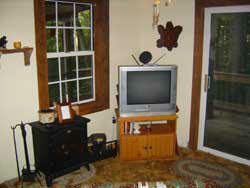 32 "tv/dvd/vcr in living room. Satellite tv with 12 movie channels in living room. Covered Front Porch and open side porch. Fire Pit (some firewood provided). Beach towels/robes for hot tub. It's the perfect getaway for couples or family, friends or singles looking to enjoy the beauty of the Hocking Hills in a comfortably furnished cabin with nature themes. Staying at our cabin is like having a home away from home in the Hocking Hills. Guests can get cozy in the warmth of an electric fireplace in winter and stay cool in summer with air-conditioning. The kitchen is fully equipped including a microwave, stove, refrigerator, pots, pans, dishes, silverware and cooking utensils. Kitchen linens are also provided. 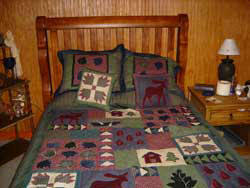 The cabin has two bedrooms, sleeping six. The large master bedroom has a queen-size bed and a second bedroom also features a queen-size bed. Both offer the luxury of pillow-top mattresses. Guests also have the added benefit of a queen-size futon if needed. And, of course, all linens are provided. Birdhouses and feeders are sprinkled throughout the property to attract many of Ohio's favorite feathered flying friends! Take a hike on our old logging road and watch the beautiful sunset, then relax by the campfire or in the six-person hot tub under the stars. No vacation is complete in the Hocking Hills without an old-fashioned picnic! There is a picnic table, charcoal grill (guests must provide charcoal) and a fire pit offered to Eagle's Nest Cabin guests.